PALESTINE. 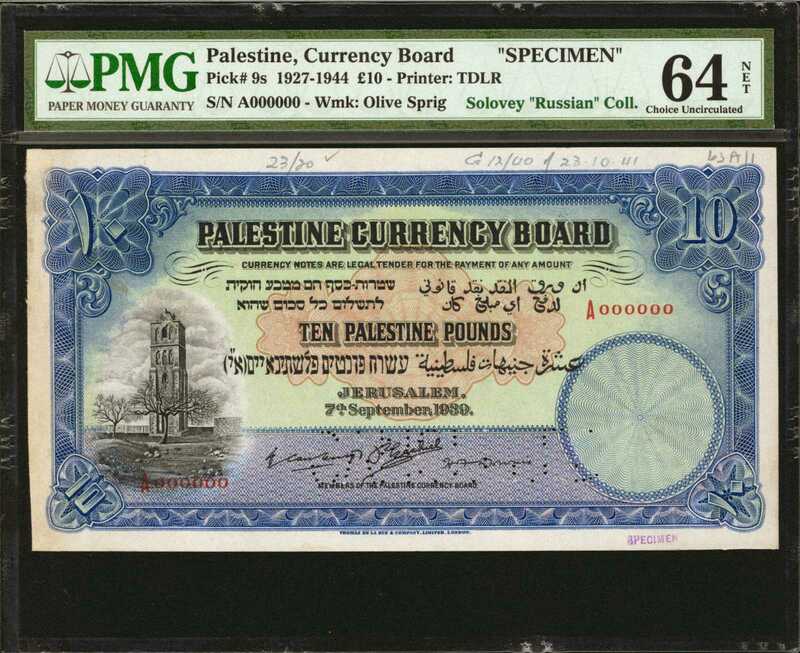 Palestine Currency Board. 10 Pounds, 1927-44. P-9s. Specimen. PMG Choice Uncirculated 64 Net. Printers Annotations. Previously Mounted.Specimen. This lightly circulated example is simply stunning in visual terms with brilliant blue hues making up the intricate TDLR border design and pleasing green inks within the under-printing. This is the only Specimen for the type graded by PMG. Aside from the few annotations and mounting, mentioned on the holder but typical for Specimens, this note is flawless. A piece that will certainly attract seasoned collectors as it is certainly missing from even the most advanced collections.From the Yuri Solovey Collection.